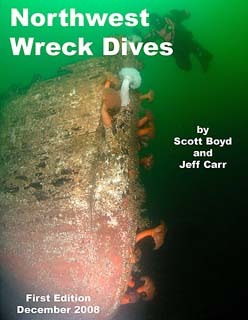 Order your copy of Northwest Wreck Dives today! Our new dive guide includes positions, maps and detailed diving information on more than one hundred of our local wrecks in and around the Pacific Northwest. A partial list of the wrecks included in the book can be found on our Wreck Diving Page. Wrecks from Puget Sound, the Strait of Juan de Fuca, the San Juan Islands and Hood Canal are covered, and more than thirty of the wrecks are accessible from shore. To order your copy of Northwest Wreck Dives please click on the Buy Now button below (credit cards accepted - you do not have to sign up as a PayPal member). Be one of the first divers in your area to enjoy the results of our years of hard work researching, locating and diving these impressive northwest shipwrecks. If you would like your copy personally autographed by the authors, please indicate who you would like us to sign the book to via the comments field of the PayPal payments form. Books are in stock and available for immediate shipment for only $24.95 + $3.05 shipping. To order, please click on the Buy Now button below. © 2017 Emerald Sea Scuba All Rights Reserved.